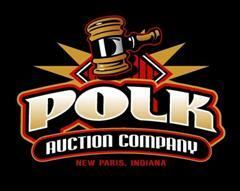 Polk Auction Company accepts consignments during normal business hours throughout the year. These consignments will normally appear in our next regularly scheduled auction in New Paris, IN. The regularly scheduled auctions that we currently have are the Late Model and Construction Auction in late January or early February each year, the Spring Collector Tractor, Toy, Literature, & Memorabilia Auction in March each year, and the Labor Day Collector Tractor, Toy, Literature, & Memorabilia Auction, each year in September. A consignment with Polk Auction offers free nationwide advertising on the internet, advertising in several agricultural and industrial publications, and appearance in our flyers promoting the auctions. We also offer a guarantee of sale on most pieces of equipment and the option of setting a reserve price to ensure your return. An alternative to a consignment of your equipment with Polk Auction is the option of having your own auction at your location managed and run by Polk Auction Company. In this situation, Polk Auction will supply the manpower necessary to have the auction and you, the customer, will supply the equipment, the site, and the additional equipment necessary to make the auction a success. We will work with you to ensure that all needs are met and all equipment is in place and ready for the auction. The Polk Auction personnel will then conduct the auction, provide the accounting for all transactions, and present you with a bill for the total commissions based on the sales. Your part in the entire process is to walk among the crowd, greet friends and neighbors, and enjoy the proceedings - we do the rest. Polk Auction is excited to announce that we are teaming up with NextLot to offer Online Only Auctions. WIth this option we also come to you and do all the work. You won’t have to haul your item to an auction site, much less take it out of your barn. You won’t have people roaming around or worry about any other minor details that it takes to have a live auction. Polk Auction personnel will manage the online auction, provide the accounting for all transactions, and present you with a bill for the total commissions based on the sales.